SIGATOKA, Fiji (AP) Ben Campbell of New Zealand shot a 6-under 66 Friday to take a four-stroke lead after two rounds of the Fiji International. Campbell is 11-under overall at the European Tour event, four ahead of Australia’s Andrew Dodt, who returned a 70 at the Natadola Bay layout. Dodt, who played in the best of the conditions in the afternoon, narrowed Campbell’s lead to three shots before dropping his first stroke of the week at the par-four 14th. One behind him are fellow Australians Jarryd Felton (71) and Terry Pilkadaris (68). Dodt said those who played in the afternoon missed a chance to close the gap on the leader, who had to contend with windier morning conditions. Campbell said the conditions he played in were better than his first round, though the wind direction caught him by surprise. 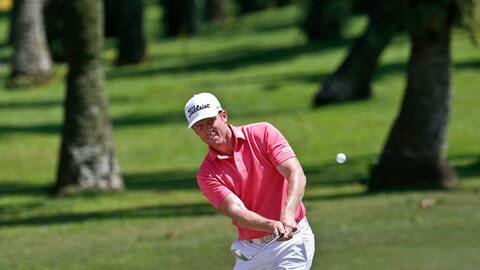 South Africa’s Ernie Els had a 2-under 70 and was in a tie for 20th place.